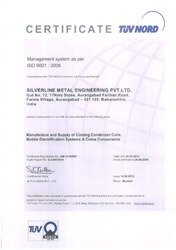 Silverline Metal Engineering Private Limited is one of the most entrusted, and notable of supplier, importer, trader, manufacturer and exporter in the industry. The company has successfully accomplished its decade of providing service and today boasts of some of the leading companies in different industries as our loyal clients. Having a client-centric approach to the work, the company has always given first preference to the convenience of client, and kept other things at secondary level. As a result, most of our first-time clients end up becoming loyal to us for long-term business deals. This is one department where we are ahead of almost all our competitors. Our product range includes Festoon System, Track Coupler, C Channel Clip, DSL System, Lug Joint Clamp, Hanger Clamp, Forged Rail Clamp, End Caps, Rail Clamping Systems, Cable Trolley, Towing Trolley, Round Cable Trolley, Wheel Assembly, Crane Buffers, Industrial Monorail Hoists, Monorail Hoist, End Carriage, Sheet Metal Component, Pallet Bowls, Automated Light Crane, I Beam Trolley, Joint Clamp, Anchor Clamp, etc. Also, our product range, and the services they provide are unmatchable to the rest of the competition, thereby giving a unique position to our company’s brand image across the globe. On a consistent basis, a constant approach to make our products even better is followed while maintaining the set standards of quality. With a humble beginning back in 1994, the company today enjoys a privileged position with an enviable infrastructure and a highly developed research and development unit. Constant efforts to introduce new innovations in the product range are made in order to extend our services and portfolio. This, combined with the global approach of work we imbibe in our process, gives our company the required fuel to go the long road of success. Manufacturing and Trading of Fabricated Machined Equipments. With an unmatched department of dedicated quality controllers, it’s no wonder quality has always been one of the highlights of our product range ever since the time we’ve started. All of our products are subjected to extreme quality tests before they are stamped for delivery to the clients. Not only is our department equipped with an enviable expertise in a number of areas including electrical stampings, dies & sheet metals components, tools, as well as sheet-metal fabrication along with powder coating and painting. With a range as extensive as ours, combining with an exclusive variety not-to-be-seen everywhere, our company manages to attract a huge customer base nationwide. Not only are our products far better than any other similar products offered in the market, they assure longer life as well. Our product range currently entails products like electric flat cables, fabricated equipment along with parts, Machined Components, Overload Safety Switch, Flat Cables, Elevators, Gas Geysers, Festoon System, DSL Systems, Rail Clamping, precision machined as well as coated flat cables. With such a wide range of products in our offering, our company entertains numerous clients from a variety of industries. Our lifts, trolleys, and DSL Systems find application in a number of different industries as per the client’s demands and requirements. Construction companies, real estate to big corporate houses, our company manages all of them with utmost ease and expertise. No company’s success story is complete without an efficient, dedicated team to the core. We, at Lifting Elevators, are blessed with one such team. All the staff members are an expert in their own respective area, and work collectively to bring out the best result every time. Also, there are a number of professional involved in the quality controllers team where each and every product is passed through a series of tests, and are sent for the delivery part only after that. Our team is an intricate mixture of hard work and intelligent approach, which always spells success for us. With our stability in delivering excellent quality precision machined, fabricated equipment and parts for industrial usage and ethical business polices, we have been able to gain the appreciation and valuable confidence of our clients. We export our range to many reputed organizations in USA & UAE. Once you know the process our company follows for each and every contract, there is no doubt left to one’s mind as to why our company should be the first and foremost option for any wise client/customer. Our ethical business policies, our unmatched quality standards, and our special client-oriented services ensure we always enjoy the premium position in the market. Since 1994, our company manages its top, entrusted position with great ease and poise.